Trendease International · October 2012 / Hibernation or Incubation? October 2012 / Hibernation or Incubation? With the current economic and political upheaval some companies are in a state of hibernation; they have fattened up before the winter and now they are laying low until the world thaws once again. And then there are those who look at this period as a time for innovation and expansion; this is their interval of time needed for the exciting new developments—the incubation. In this period of flux the planet continues to move. This issue reviews international trade shows and shares insights from the movers and shakers. Get inspired with the October edition! Paris/London — Some of us are still spinning from the slew of fall design events that literally just wrapped up. 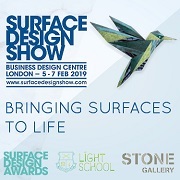 Maison&Objet, then MoOD, followed by London Design Festival including 100% Design, Tent, Designersblock, The Dock, The Bargehouse, V&A, and Decorex, plus PV Pluriel, kept us on our toes! Read up on the shows and be stopped in your tracks when Prometheus comes home to Andrew Martin. 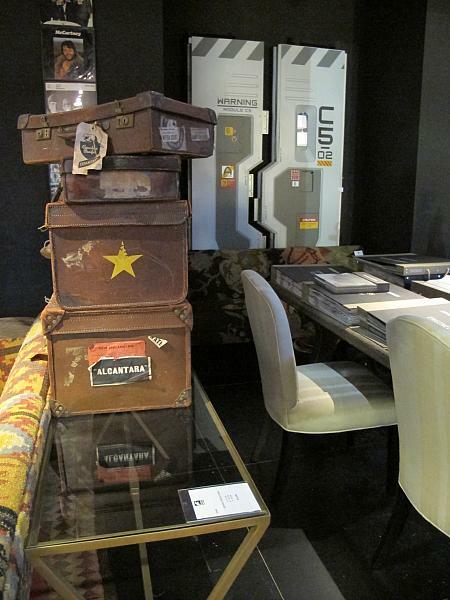 Paris — The Observatory research team at Maison&Objet launched its new 2012/2013 inspiration theme titled Essential. Under this theme follow three trends and their corresponding displays: Element(s), Minimum, and Yes Future. After the trend preview and video presented in July, the Trendease Team is pleased to bring you coverage hot off of the exhibition floor. Here François Bernard lays out Element(s) combining geometrical, archetypal, molecular, and abstract forms. Paris — Is less really more? Elizabeth Leriche believes it is and aims to demonstrate this in the scenography of Minimum. “In math, the term minimum designates the smallest degree to which you can reduce a value. Here, our minimum has become a uniqueness, an added value, a character that shapes the perception and process of manufacturing an object.” Here we have a thought-provoking concept and a new idea surrounding consumerism. London — During the London Design Festival Keiichi Matsuda's installation titled Prism, commissioned by Veuve Clicquot, was installed in the cupola of the V&A's ceramics galleries. This was only accessible by climbing steep, winding staircases never before opened to the public. It was a thrilling experience for members of the Trendease Team. See the patchwork of digital patterns here without even breaking a sweat. Paris — Words of poetry introduce the ModAmont trends for Fall-Winter 2013/14. The Trendease Team paid a visit to the international event where visitors could find the latest trims on offer. While there, we reviewed the new trends presented. ModAmont’s inspirations book and show vignettes forecast the season trimming trends; featured here within are inspirations, styling, market sectors, details, and color moods. It is always intriguing to keep one’s finger to the pulse of fashion as there is much that can be translated to the fashion of the home. Paris — In July Trendease previewed Le Cuir à Paris’ Fall-Winter 2013/14 “Outlandish” theme for the trends to be presented in September. This gallery brings you a review hot off of the show floor. “Outlandish” is the vehicle for this season’s journeys. It is the link between the five stories. A fancy for foreign, rather than strange, takes over our daily lives or thrusts us into an undefined time and space. Multiple Turkish Cities — Lobster Concepts’ “Motion” textile and contract directions for 2013 travelled from Turkey to Belgium for MoOD. The themes and Pantone color stories that Trendease covered from Evteks are presented with new merchandising that is slightly different with fresh samples to support the trends. There is an impressive range of textiles available through the mills in Turkey, and here you can find the crème de la crème. Paris — Not only do we see a deep personal reflection taking place with consumers, we see designs getting more personal with portraits. Faces on decorative accessories, textiles, buttons and broaches, and even dishes. Texworld chose “Portrait” as its theme for next winter, extending beyond the visual to a deeper meaning. And while delving deeper we also see a pick-up in the demand for eco textiles, but perhaps it isn't picking up as quickly as we would like. 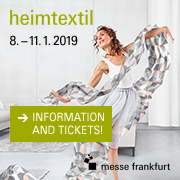 Frankfurt — Now that MoOD has passed, Heimtextil is the next big European textile show on the calendar. What directions do we still see continuing from January? In this gallery you can see gradation of colors, bright and super-sized florals, textiles with 3D touches, ethnic prints and weaves, florescent color accents, and international influences. We also catch up with Heimtextil blogger Kerstin Böhning who spoke with Trendtable member Louis Gérin to discuss fashion and the home. Brussels — The content of this week’s newsletter is brought to you by popular demand. As many of you know, and some of you have followed it on Facebook and Twitter, Trendease selected a range of samples to be showcased on MoOD’s Innovation Platform last month. It was a highlight of the show this year. Those who couldn't attend, and even some who were present, have asked for our coverage of the platform. Ask and ye shall receive! Bangkok — Starbucks called upon Intrachooto with the challenge of transforming their coffee waste into construction material to be used for furniture in their Mega Bangna store in Bangkok, Thailand. The complete collection envisioned by Intrachooto and his team, recently unveiled, includes of two community tables, two condiment bars, and five round tables. Subscribers can view a selection of the coffee grounds products here. NEWSLETTER #416 - Knitting Grannies Rock! Eindhoven — Learn about the heartwarming discovery of Granny’s Finest. This initiative aims to keep a group of elderly women in Rotterdam from becoming lonely and insolated as they get older. Under the slogan “Designed by the new, produced by the best, worn by the greatest!” a community of young designers co-create with experienced knitters to bring the market feel-good fashions.